alaTest has collected and analyzed 311 reviews of JVC LT-49C550. The average rating for this product is 4.1/5, compared to an average rating of 4.3/5 for other products in the same category for all reviews. Reviewers are impressed by the design and size. The usability and image quality are also appreciated. Some have doubts about the reliability and color. We analyzed user and expert ratings, product age and more factors. Compared to other products in the same category the JVC LT-49C550 is awarded an overall alaScore™ of 89/100 = Very good quality. Set developes huge time lag before responding to controls. Switched off and left for a minute it works properly when restarted. Nice slim looking and modern television. Quite easy to use considering I'm a techno-phobe. Just the delay sometimes when changing channels but I understand this is apparently normal for televisions these days. The sound is terrible. I had to buy a sound bar to accompany the tv. The price. 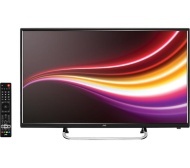 If you have no use for a 'Smart' TV this JVC is excellent value with a very good quality image. The built-in speakers are poor but this model has this in common with almost every other TV of this format.